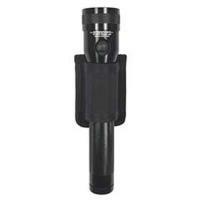 This high quality flashlight holder from Gould & Goodrich is a comfortable, convenient carrying solution for your light. The B676-1 holster fits securely to your belt for maximum safety and convenience, placing it right under your hand for a quick draw. The fastening system can accommodate belts of up to 2.25" width. Its lightweight but durable leather and nylon construction is ideal for prolonged wear, and it is also compatible with several models of baton for additional versatility on duty.